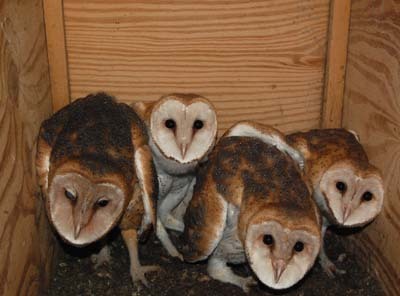 Barn owls nested in box 2 on the barn again this summer. 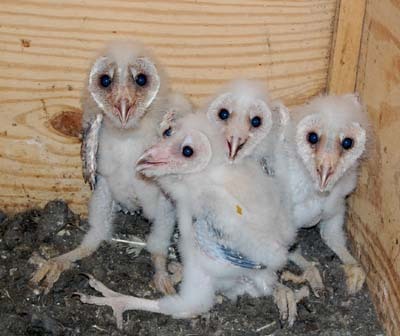 The first of 4 eggs was laid on 5/14 and the nesting was uneventful. 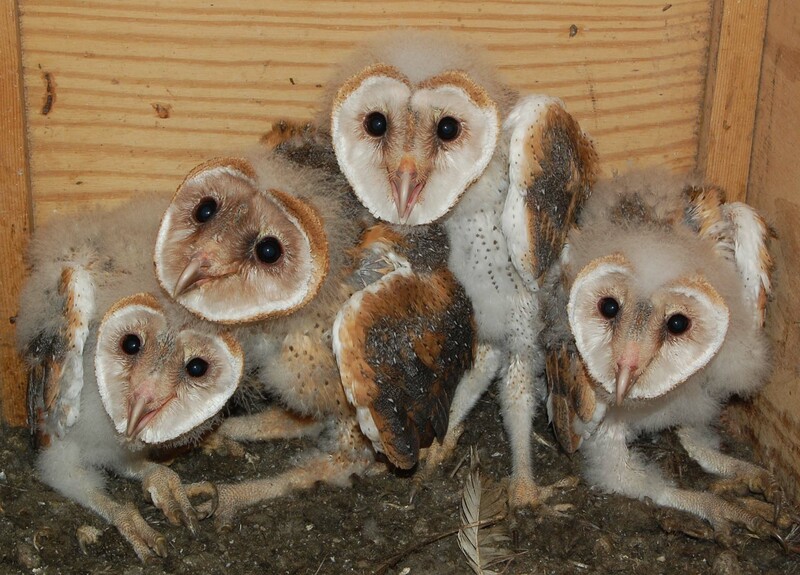 Although a female had entered the new box "1" several times, there was no second pair nesting this year. 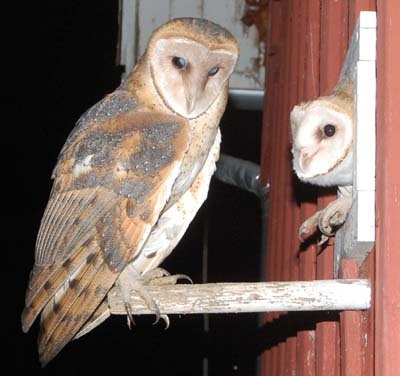 The visitor to box 1 was likely the same female nesting in box 2. I had finally converted the silo to a chimney swift shaft, which precluded the second pair from nesting there again or the male from using the silo for his day roost. 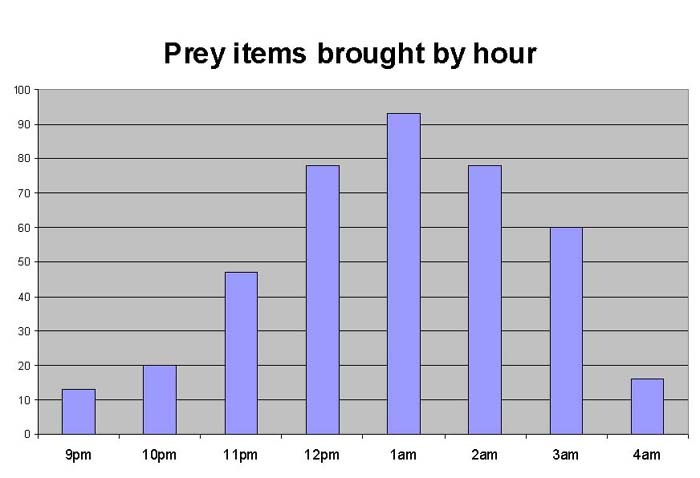 Prey provisioning was recorded on continuous video each night, beginning the first night the female left the box to resume hunting. 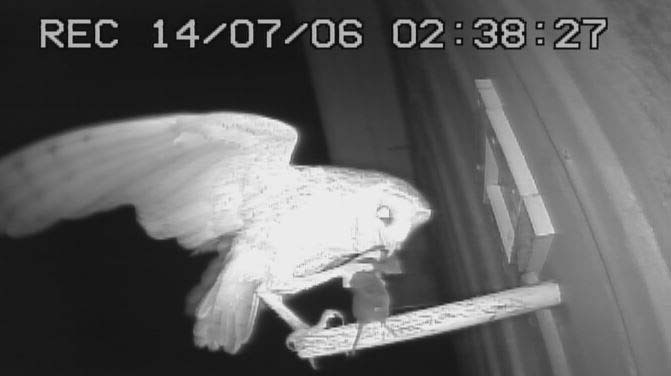 This ensured that all prey items recorded were consumed only by the nestlings. The missing data on Aug 3, 4 and 12 was due to video being overwritten or a momentary power failure stopping the recording. In one case, a spider continually wove it's web across the lens in the early morning. 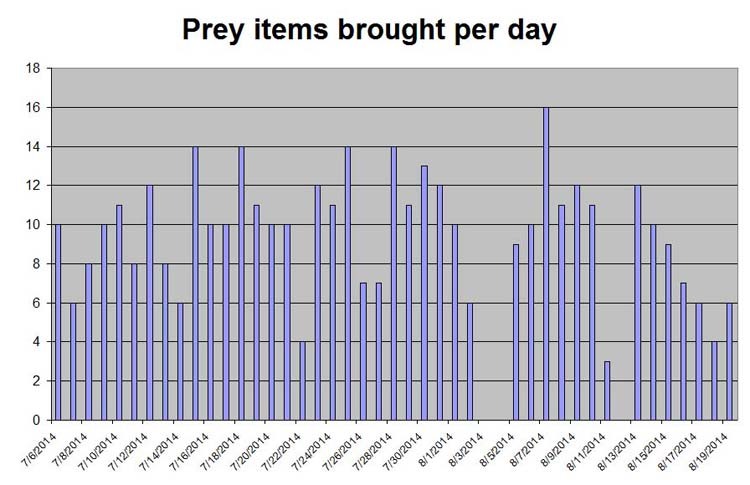 Also, nights with few prey were due to prolonged rain, making hunting less than ideal. 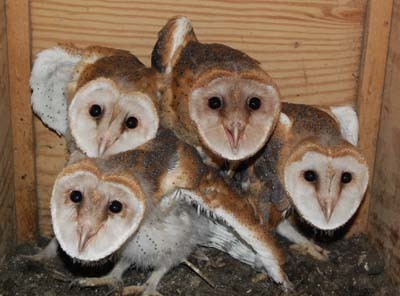 2015 - No Barn Owls! 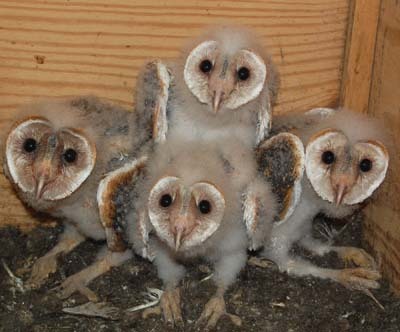 A prolonged snow cover in the previous winter, including a layer of ice had kept the meadow voles safely under cover, which may be the reason that no barn owls have been seen or heard since December, 2014. 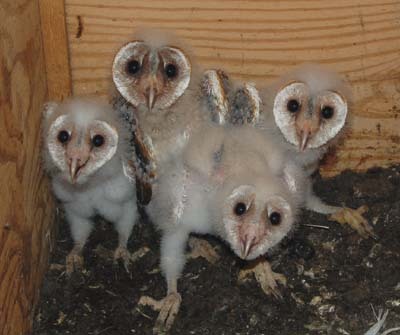 Nest box monitoring, beginning in January, 2015 showed no owl visits. 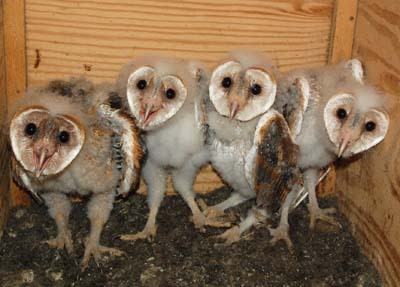 The boom and bust cycle of meadow voles every few years has been well documented by many sources and can be linked to nesting success of barn owls the following year. However, I have never been able to judge such a boom and bust cycle of voles on our property. There were numerous vole trails exposed when the snow melted and our resident foxes seemed to do quite well. 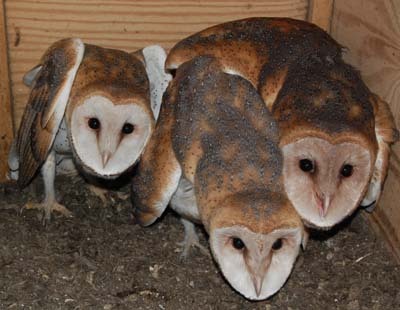 But, barn owls are not equiped to break through deep snow and ice to reach their prey. 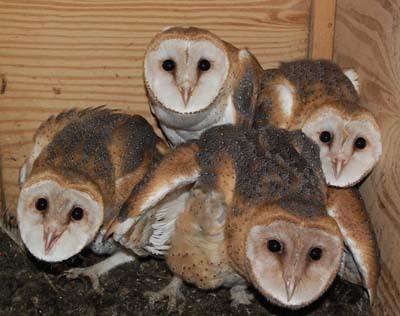 The conventional thought is that barn owls often starve to death during such weather. 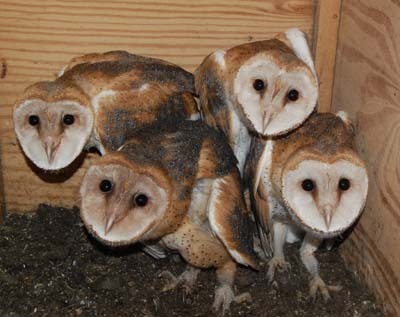 But, another possibility is that the owls resort to hunting rodents in surrounding barn yards and feed lots where bare ground is exposed and mice and rats are present. 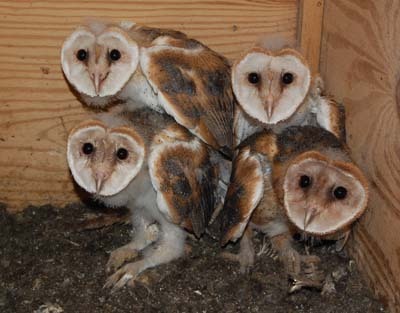 These barn yard rodents are often poisoned with the second generation rodenticides, including brodifacoum. 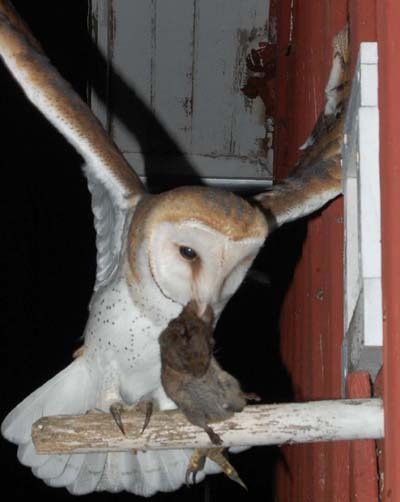 The mice continue to live for several days, while consuming more of the poison bait - enough to kill a barn owl. 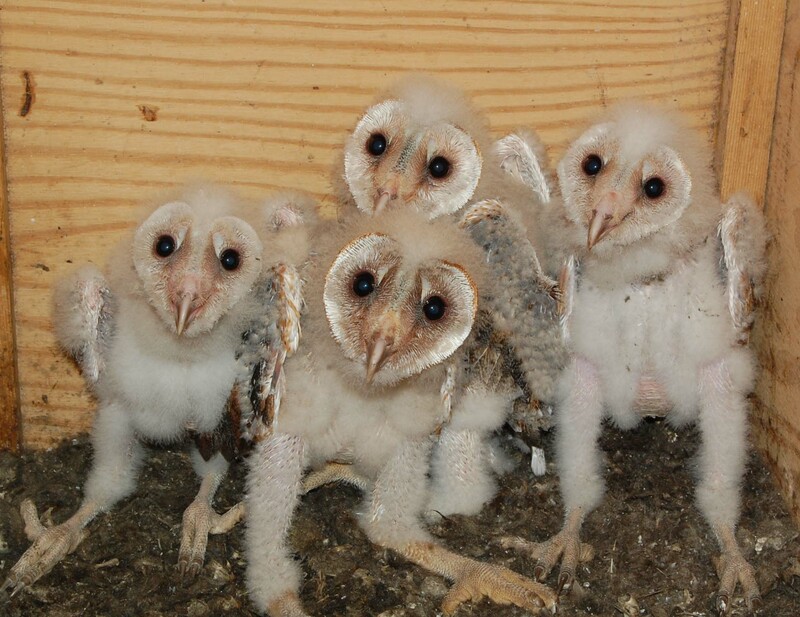 Whatever the fate of all our barn owls, nest box video monitoring will begin this week (Feb 2016). The ground is still snow-covered, but our cat ventures out for an hour or so each day and frequently comes back with a vole. 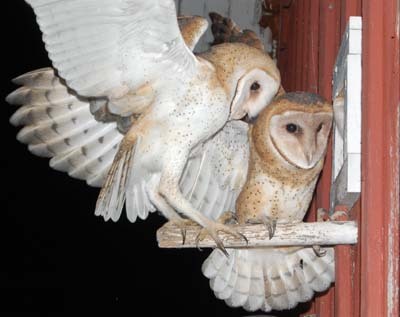 Hopefully, at least one pair will use one of the owl boxes again this year. 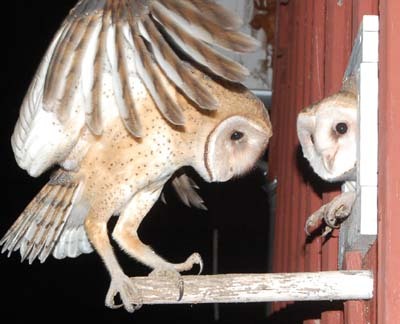 2016 Still no barn owls! 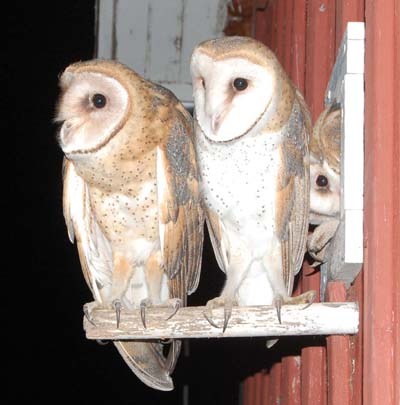 - While both barred owls and great horned owls are heard in the area, there has been no sign of a barn owl yet. This has been a mild winter with almost no snow cover as of Feb 14, 2017. Still hoping!